We saw Farmageddon – The Unseen War on American Family Farms last week. It’s produced and directed by Kristin Canty, a mom of four, who couldn’t understand why the healthy food she wanted to buy for her family, was so hard to find. This is not the American Way! I thought Farmageddon was brilliantly directed. Where it could have just been a very depressing story, there’s hope here too. It’s about the growing real food movement and how more and more people are looking to buy their food directly from their local farmers. 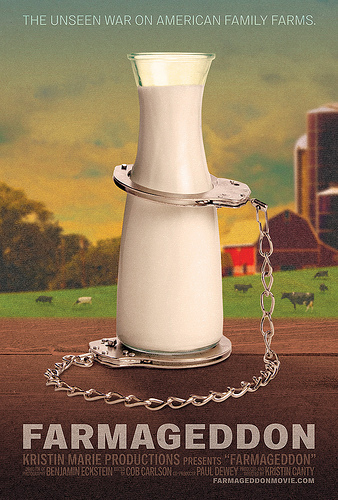 It’s time for all of us to stand up for food freedom. For the freedom to choose real food for our families and for the choice to not have our food contaminated by GMOs. I am starting to wonder if it’s going to take acts of civil disobedience – nonviolent resistance – and becoming vocal to the point where the FDA, USDA and our government understand that we are not going to put up with our small farmers being harassed and raided for good no reason. It’s time to stand up for ourselved and our farmers! This is a film that everyone should see. It’s only in a few theaters now, but if you are near anywhere there is a showing, it’s an incredible film. Below is the link to the website. There you can watch the trailer and see or arrange a screening. Highly recommended! I have been waiting to see this movie and I am really looking forward to it. In this country we have the mistaken perspective that the government is here to help and that we are innocent ’til proven guilty. This film will show, in a stark and dramatic way, that this is not the case. You’re right, Melissa! Kristin, who spoke after the showing, was telling us that many people just don’t understand how pervasive these raids are becoming. People thought that the farmer must have done something wrong, or it was an isolated incident, which we know, unfortunately is not true. Our corporate owned government is not protecting us anymore…. Beth, thank you for mentioning that. Kristin is asking a very nominal fee to show the movie. This is one that everyone should see! Thanks for reviewing this wonderful and important film! For anyone in a city that does NOT have viewings scheduled, please form a grassroots group, contact the director and booking agent/publicist and bring it to your town! There are a million ways to create buzz and partnership involvement. Think social media, local chefs, sustainable food blogs, independent theaters, non-theater venues, farmers’ markets, natural health practitioners, college nutrition and sustainability departments, environmental groups, etc. etc. Thanks for the review. I’m hoping to see it.